Home / Needlework / How to make a pompom on a hat with the help of improvised tools? How to make a pompom on a hat with the help of improvised tools? The needlewomen engaged in knitting are no longer aloneYear, this article is unlikely to be useful, because making pompoms or buboes is one of the first lessons mastered in knitting lessons. But those who accidentally lost a pompom from a hat or scarf, may face a problem: the hat has lost all its charm and childish fervor, but few know how to solve this problem. How to make a pompom on a hat? Today this headdress is popular as never before. Caps with large buboes or pompons are worn by both men and women, because this accessory belongs to the style of unisex. They are ideally combined with down jackets and other blown jackets and coats, besides such caps are incredibly warm and capable of warming even in extreme cold. If you accidentally lost the main decoration of such a headdress - pom-pom, or bought an ordinary sports hat, and decided to do a pompom yourself, this article is for you. There are several ways of making such aRound fluffy glomerulus, crowning a knitted cap. To do this, you can use any improvised means - a matchbox, a diary and even a mobile phone. If desired, help yourself and your fingers. And in the shops for needlewomen you can findSpecial devices to get a perfectly round bubo. They can have a wide variety of usability and design, but they cope with their task 100%. How to make a pumponchik on your hat? If you are not going to put the production of pompoms on the flow, you can do it on your own. 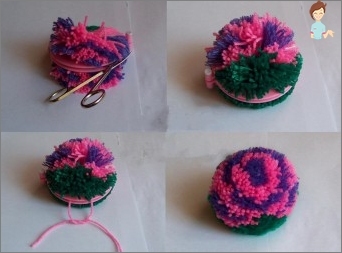 Without using any improvised tools and templates, you can become the owner of a thick and beautiful pompon on the hat. Now it remains to cut the tangle in scissorsPlaces of yarn bends. Straighten the fibers of the yarn, fluff them, and if there are irregularities somewhere and the individual threads are knocked out in height from the total mass, they need to be cut. This option involves the use ofCardboard, or rather two cardboard blanks of round shape. 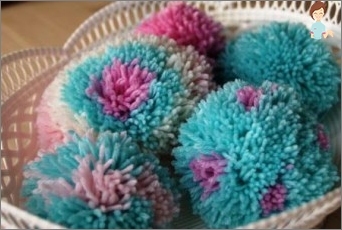 Depending on what diameter of the pompom you want, draw one circle on the cardboard. Of course, it is better to do it with a compass. If it is not available, you can circle the jar, cup, thermos and any other round shape object. In the center of this large circle you need to drawA very small circle, enough so that when you cut it out, you can easily thread a thread in this hole and repeat these actions more than once. How correctly to make a balabon on a hat? To do this, you need two carton circles. That is, you need to cut two identical blanks, make a hole inside each circle along the line drawn, join them together and start wrapping the yarn, moving in a circle. The more dense the yarn, the more magnificent the bubo will turn out. After completing the winding process, it is necessary to cutYarn along the outer edge of the blanks and slightly push them apart. This is necessary in order to draw them in the middle with a thread. She must tightly tie the bundle so that you can safely remove the workpieces and bring the pompom in the proper form. Just like in the previous case, all the unevennesses can be trimmed with scissors, and then sew a bubo to the hat, scarf and other product. You can make a lot of big colorful buboes of different colors and put them together in a single scarf. It turns out a beautiful large accessory that can decorate your image even on the most cloudy days. Enjoy your handiwork and fun pompoms!